men who formed and fashioned her pivotal foundations. We are a nation under God!!! 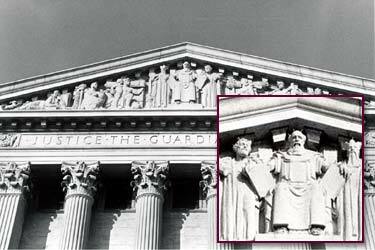 As you walk up the steps to the building which houses the U.S. Supreme Court you can see near the top of the building a row of the world's law givers and each one is facing one in the middle who is facing forward with a full frontal view ... it is Moses and he is holding the Ten Commandments! 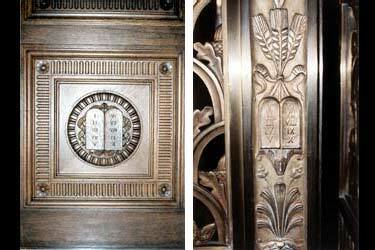 As you enter the Supreme Court courtroom, the two huge oak doors have the Ten Commandments engraved on each lower portion of each door. 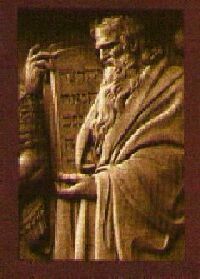 a display of the Ten Commandments! Federal Buildings and Monuments in Washington, D.C.
"It cannot be emphasized too strongly or too often that this great nation was founded not by religionists, but by Christians; not on religions, but on the Gospel of Jesus Christ." Every session of Congress begins with a prayer by a paid preacher, whose salary has been paid by the taxpayer since 1786. Fifty-two of the fifty-five founders of the Constitution were members of the established orthodox churches in the colonies. Some either changed church affiliation in their lifetimes or had dual membership. Thomas Jefferson worried that the Courts would overstep their authority and, instead of interpreting the law, would begin making law an oligarchy ― the rule of few over many. Jefferson added that he knows of "no safe depository of the ultimate powers of the society but "the people themselves" and that the power did not belong to a judicial oligarchy. "Providence has given to our people the choice of their rulers, and it is the duty, as well as the privilege and interest of our Christian nation to select and prefer Christians for their rulers." There can never be a building of greater height in Washington DC, our nation's capitol, than the Washington Monument. On the aluminum cap, atop the Washington Monument in DC, are displayed two words: Laus Deo. No one can see these words. In fact, most visitors to the monument are totally unaware they are even there and for that matter, probably couldn't care less. Once you know Laus Deo's history, you will want to share this with everyone you know. But, these words have been there for many years; they are 555 feet, 5.125 inches high, perched atop the monument, facing skyward to the Father of our nation, overlooking the 69 square miles which comprise the District of Columbia, capital of the United States of America. Though construction of this giant obelisk began in 1848, when James Polk was President of the United States, it was not until 1888 that the monument was inaugurated and opened to the public. It took twenty-five years to finally cap the memorial with the tribute Laus Deo! From atop this magnificent granite and marble structure ... a visitor can take in the beautiful panoramic view of the city with its division into four major segments. And from that vantage point one can also easily see (whether plan of the designer, Pierre Charles l'Enfant , or by Divine Intervention ) a perfect cross imposed upon the landscape, with the White House to the North ... the Jefferson Memorial to the South ... the Capitol to the East ... and the Lincoln Memorial to the West. A cross ... you say? What about separation of church and state? Separation of church and state was not, is not, in the Constitution. How interesting! And no doubt intended to carry a meaning for those who bother to notice. Within the monument itself are 898 steps and 50 landings. As one climbs the steps and pauses at the landings the memorial stones share a message. On the 12th Landing is a prayer offered by the City of Baltimore; on the 20th is a memorial presented by some Chinese Christians; on the 24th a presentation made by Sunday School children from New York and Philadelphia quoting Proverbs 10:7, Luke 18:16 and Proverbs 22:6. When the cornerstone of the Washington Monument was laid on July 4th, 1848 deposited within it were many items including the Holy Bible presented by the Bible Society. Praise be to God! 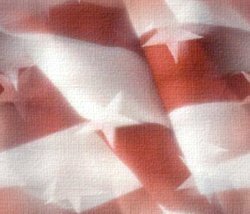 Such was the discipline, the moral direction, and the spiritual mood given by the founder and first President of our unique democracy "One Nation, Under God." 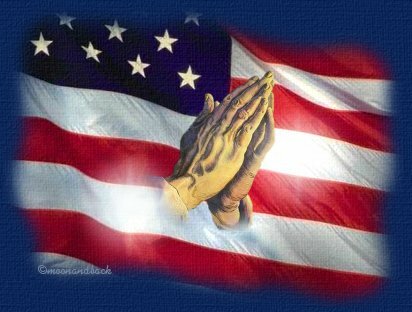 I am awed by Washington's prayer for America. If you've never read it, now is your unique opportunity, so read on! "Almighty God; We make our earnest prayer that Thou wilt keep the United States in Thy holy protection; that Thou wilt incline the hearts of the citizens to cultivate a spirit of subordination and obedience to government; and entertain a brotherly affection and love for one another and for their fellow citizens of the United states at large." And finally that Thou wilt most graciously be pleased to dispose us all to do justice, to love mercy, and to demean ourselves with that charity, humility, and pacific temper of mind which were the characteristics of the Divine Author of our blessed religion, and without a humble imitation of whose example in these things we can never hope to be a happy nation. Grant our supplication, we beseech Thee, through Jesus Christ our Lord. Amen." the watchmen stand guard in vain." despite all its great strength, it cannot save. It is hoped you will share this with every child you know, and every sister, brother, father, mother or friend. They will not find offense, because you have given them a lesson in history that they probably never learned in school. With that, be not ashamed, or afraid, but have pity on those who will never see. Page melody is "Hymn Medley #1"
Email Mom to receive our mailing address for submitting photo or other site material. (It will be immediately scanned and returned to you via U.S.P.S. insured delivery.) Material may also be emailed.